25% of Fortune 500 companies have an Instagram account according to TrackMaven. In aggregate, they’ve posted over 19,009 photographs and 243 videos through September 17, 2013. These F500 corporations provide social media and branding lessons for other businesses seeking to take advantage of the power of visual content on Instagram. To put these figures in perspective, Instagram reaches over 150 million monthly active users and it has achieved this in less than 3 years. These users share over 16 billion images each month – an average rate of 55,000 photographs per day. 60% of Instagram’s users are located outside of the US. The impact of this visual content is even greater when you take into consideration that 83% of learning is visual according to Annalect.com. Here are 8 tips from Instagram’s Fortune 500 experience that you can use to maximize your brand and social media results. 1. Over 9o% of these 123 Fortune 500 companies have posted at least once and over 15% have posted (photo and/or video) at least once in the past month. 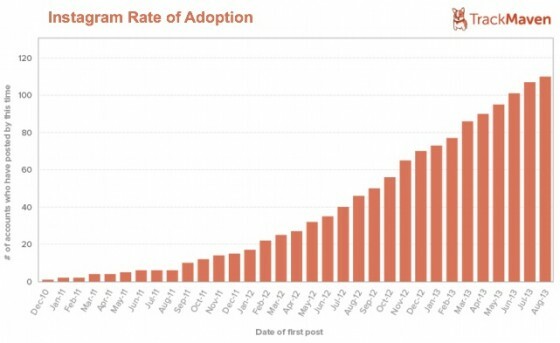 This means there’s limited Instagram activity on average since less than one in ten F500 firms have only staked out their account. Instagram tip: Like other social media platforms, you need to actively use Instagram to gain the benefit of being present there. Take a deeper look at Fortune 500 participation on Instagram to see some interesting trends. 2. 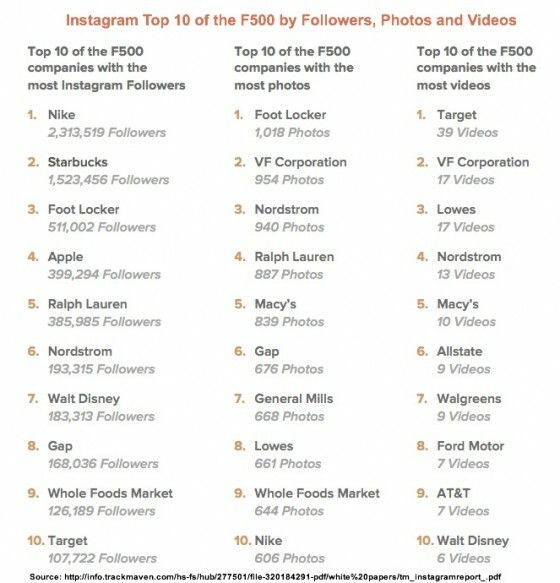 Top ranked Nike with 2.3 million Instagram followers and Starbucks with 1.5 million followers outdistance third placed Footlocker’s 511,022 followers. Since there’s a big dropoff in Instagram follower counts through out the Top 10, there’s room for an organization to break into the top tier with a coordinated and consistent program to encourage prospects and customers to share images. 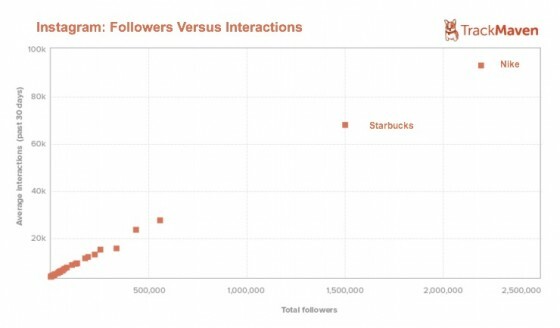 Instagram tip: Understand that others, especially Nike and Starbucks, have a significant head start. An organization would need to coordinate their marketing and content efforts across platforms, social media, owned party and third party media. As Instagram continues to grow this will become more difficult to achieve. 3. Footlocker tops the list of photographs shared with 1,018 images while Nike rounds out the bottom of the Top 10 list with 606 photographs. There’s less than 500 images difference between the top and bottom of the list. Instagram tip: Boosting your Instagram presence is doable with focused effort including a regular schedule of posting and promotion process. 4. 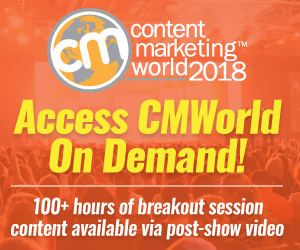 Video is an even bigger opportunity than photographs because it’s a newer offering that marketers have been slow to adapt. Disney is in the Top 10 with a mere 6 videos. Instagram tip: Gaining traction in the video category is relatively easy since it’s still a very new functionality where there are no true leaders. Brainstorm an interesting way to use short videos to build your offering. 5. On Instagram, there’s a high correlations between interactions, both likes and comments, and the number of followers a firm has. This remains true even when Nike and Starbucks, the outliers, are removed from the data. Instagram tip: Use Instagram for follower engagement. It’s also a great place to get potential customers interested in your offering. 6. As with any other social media platform, it’s easier to get users to do a small action than one involving work or creativity. On Instagram, 97% of the interactions are likes which require a mere couple of taps versus composing a comment. Instagram tip: Make it easy for followers to act. Provide content they want to share and talk about. 7. 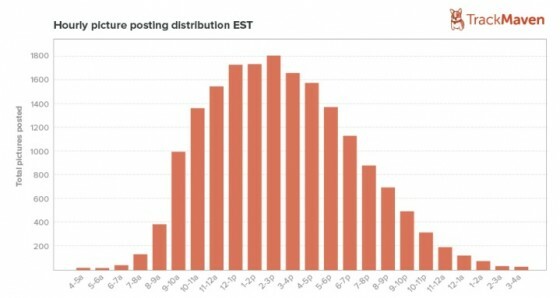 While companies tend to post during the week during business hours, Instagram posting peaks on Thursday. When standardized, there’s very little difference. Further the timing of photograph distribution is normal with a slight exception for midday business hours. According to TrackMaven, 3-4 PM EST is the most popular time – 1,662 F500 photos were posted then. This makes sense since it’s middle of the afternoon on the east coast and lunch time on the west coast. Instagram tip: No special day of the week or time is better than others. Test posting at times that followers are active. 8. 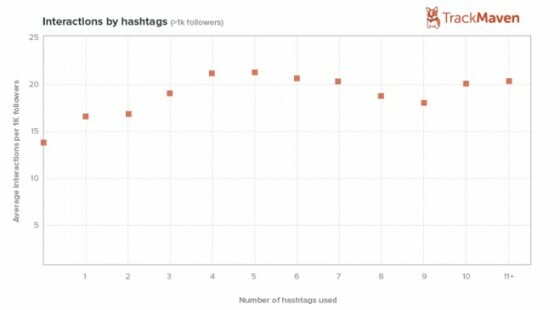 Hashtags have a surprising impact on Instagram interactions. 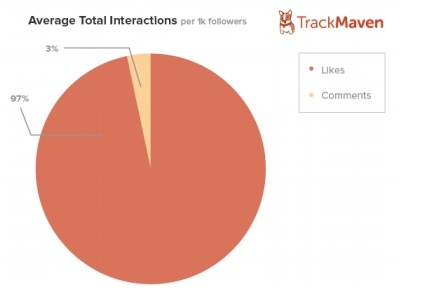 TrackMaven found that using 4 to 5 hashtags maximized Instagram interactions. But more than 5 hashtags depressed engagement. Instagram tip: Use hashtags carefully and test what works best with your audience. 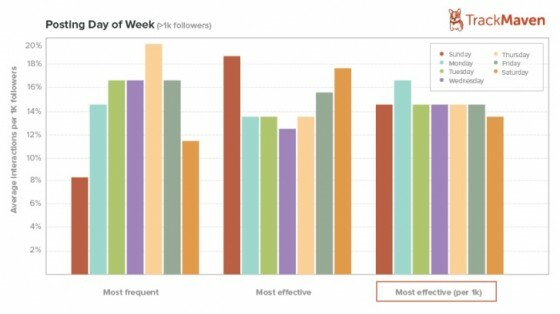 To leverage the power of visual content, enhance your brand’s presence on Instagram by setting a schedule of regular content sharing based on TrackMaven’s findings. This will improve your social media engagement. What other Instagram tips have you found to be successful and why? Tags Charts, Fortune 500, Instagram, Instagram tip, Research, TrackMaven. Bookmark the permalink. 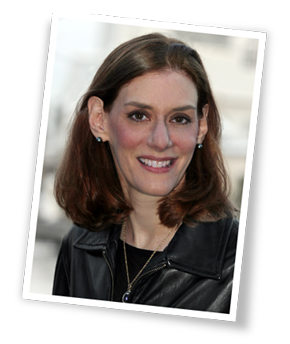 What an amazing article you’ve got here Heidi! Very informative yet useful. Thanks for sharing some tips here. By the way, if you happen to be interested in buying real instagram commenters, you can check out their awesome site. They’re real and legit. Just click below. I think the fact that around 83% of learning is visual is something that companies really need to think about. Many companies have taken advantage of that by putting picture on Twitter and Facebook, but why not use Instagram too? It’s what it’s there for. Helpful article! Hi Heidi, I like your tips on using Instagram in business. I completely agree that this is a great social network for businesses nowadays and I appreciate the statistics you’ve shared in the intro. Tips number 3 and 6 are particularly important, in my opinion. with more efficient video feature which is more reliable than that of vine I guess. Thank you so much for this article, I want to stress on the point of keeping your customer loyal to you. one of the things you can maintain this is by answering their question on social media channels. put into consideration that you may have angry customers that you need to handle, don’t reject or delete their question but answer professionally and try to work with them to solve the problem.